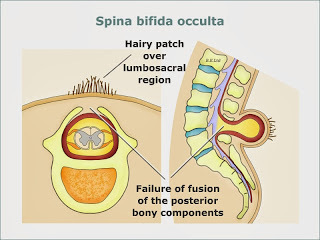 Spina bifida (SB) is a neural tube defect (a disorder involving incomplete development of the brain, spinal cord, and/or their protective coverings) caused by the failure of the fetus's spine to close properly during the first month of pregnancy. 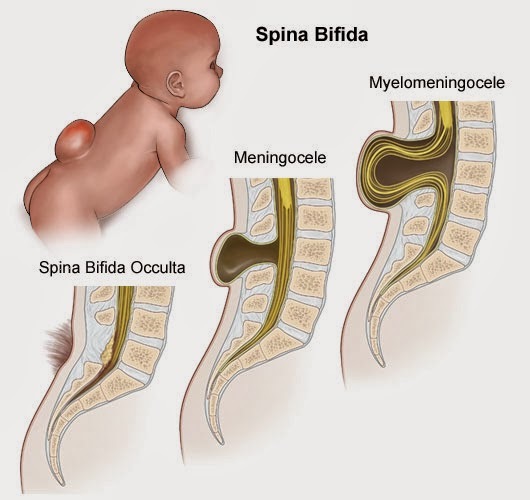 Infants born with spina bifada sometimes have an open lesion on their spine where significant damage to the nerves and spinal cord has occurred. Although the spinal opening can be surgically repaired shortly after birth, the nerve damage is permanent, resulting in varying degrees of paralysis of the lower limbs. Even when there is no lesion present there may be improperly formed or missing vertebrae and accompanying nerve damage. In addition to physical and mobility difficulties, most individuals have some form of learning disability. The three most common types of spina bifada are: myelomeningocele, the severest form, in which the spinal cord and its protective covering (the meninges) protrude from an opening in the spine; meningocele in which the spinal cord develops normally but the meninges protrude from a spinal opening; and occulta, the mildest form, in which one or more vertebrae are malformed and covered by a layer of skin. 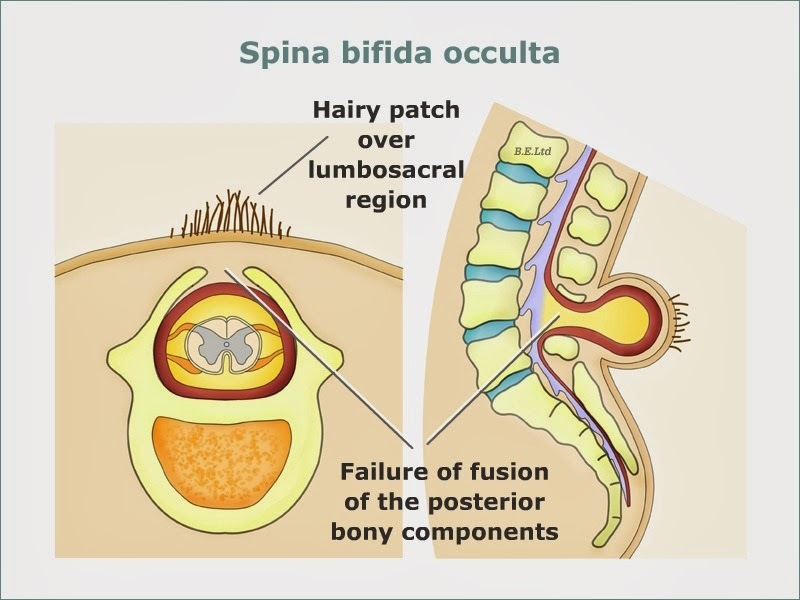 Spina bifada may also cause bowel and bladder complications, and many children with spina bifada have hydrocephalus (excessive accumulation of cerebrospinal fluid in the brain). Occulta is the mildest and most common form in which one or more vertebrae are malformed. The name "occulta," which means "hidden," indicates that the malformation, or opening in the spine, is covered by a layer of skin. This form of spina bifida, present in 10 to 20 percent of the general population, rarely causes disability or symptoms. In the third type, meningocele, spinal fluid and the meninges protrude through an abnormal vertebral opening; the malformation contains no neural elements and may or may not be covered by a layer of skin. Some individuals with meningocele may have few or no symptoms while others may experience symptoms similar to closed neural tube defects. Myelomeningocele, the fourth form, is the most severe and occurs when the spinal cord/neural elements are exposed through the opening in the spine, resulting in partial or complete motor paralysis and sensory deficits within the parts of the body below the spinal opening. The paralysis may be so severe that the affected individual is unable to walk and may have urinary and bowel dysfunction. Exactly how folic acid helps prevent spina bifida is still uncertain. It may affect how the cells and tissue form in the developing baby..
You should never stop taking a prescribed medication unless advised to do so by your GP or another qualified healthcare professional responsible for your care. You can use the healthy weight calculator to work out your BMI. Complications of spina bifida range from minor physical problems to severe physical and mental disabilities. It is important to note, however, that most people with spina bifida are of normal intelligence. Children with myelomeningocele and/or hydrocephalus (excess cerebrospinal fluid in and around the brain) may have learning disabilities, including difficulty paying attention, problems with language and reading comprehension, and trouble learning math. In addition to abnormal sensation and paralysis, another neurological complication associated with spina bifida is Chiari II malformation - a condition common in children with myelomeningocele - in which the brain stem and the cerebellum (hindbrain) protrude downward into the spinal canal or neck area. This condition can lead to compression of the spinal cord and cause a variety of symptoms, including difficulties with feeding, swallowing, and breathing control; choking; and changes in upper extremity function (stiffness, swelling). Chiari II malformation may also result in a blockage of cerebrospinal fluid, causing hydrocephalus. The buildup of fluid puts damaging pressure on the these structures. Hydrocephalus is commonly treated by surgically implanting a shunt - a hollow tube - in the brain to drain the excess fluid into the abdomen. A pregnant woman can have a blood test (maternal serum triple or quadruple screen) and a fetal ultrasound to check for spina bifida and other problems with the fetus. If test results suggest a birth defect, she can choose to have an amniocentesis. This test helps confirm if spina bifida exists. But the test also has risks, such as a chance of miscarriage. After birth, doctors can tell if a baby has spina bifida by how the baby’s back looks. The doctor may do an X-ray, an MRI, or a CT scan to see if the defect is mild or severe. There are several different treatments for the symptoms that spina bifida can cause. A back brace is often also used to treat the symptoms of scoliosis. Folic acid, also called folate, is an important vitamin in the development of a healthy fetus. Although taking this vitamin cannot guarantee having a healthy baby, it can help. Recent studies have shown that by adding folic acid to their diets, women of childbearing age significantly reduce their risk of having a child with a neural tube defect, such as spina bifida. Therefore, it is recommended that all women of childbearing age consume 400 micrograms of folic acid daily. Foods high in folic acid include dark green vegetables, egg yolks, and some fruits. Many foods - such as some breakfast cereals, enriched breads, flours, pastas, rice, and other grain products - are now fortified with folic acid. Most multivitamins contain this recommended dosage of folic acid. Don't drink alcohol while you are pregnant. Any amount of alcohol may affect your baby’s health. Help your child be active and eat healthy foods. Talk to your doctor about early treatment. Most children who have spina bifida and their parents work with people such as physical therapists or occupational therapists starting soon after the baby is born. Therapists can teach parents and caregivers how to do exercises and activities with the child. If your child has bladder control problems, help him or her use a catheter each day. It can help prevent infection and kidney damage in your child. If your child has little or no feeling in the limbs and can't sense pain, he or she may get injured and not know it. You may need to check your child’s skin each day for cuts, bruises, or other sores. When your child is ready to go to school, talk with teachers and other school workers. Public schools have programs for people ages 3 through 21 with special needs. Take good care of yourself so you have the energy to enjoy your child and attend to his or her needs. Ask for help from support groups, family, and friends when you need it.